The lifespan of those roads could be significantly extended if you repair the potholes – especially if you fill them before they get too big. And the Python 5000 pothole patcher is the right machine for the job. It can be used year-round, and can fill three times as many potholes as a crew using traditional methods. The Python 5000 uses standard asphalt mixes and then compacts the patches, with the result being permanent patches that can outlast the road around them. Even more important, the operator of a Python 5000 stays safely inside the machine during the entire operation. Using those 2003 cost estimates, if you were to delay resurfacing five miles of a two lane non-core urban street for five years, your interest-only savings at 5% interest would reach nearly $1 million. Another major saving is the cost of potential lawsuits from people who have damages resulting from unrepaired potholes. In addition, the “Rough Roads Ahead” report says unrepaired potholes add $335 annually to typical vehicle operating costs. In urban areas with high concentrations of rough roads, extra vehicle operating costs can be as high as $746 annually. There are 240 million registered vehicles in the United States. If you multiply that figure by an average cost of $540, you arrive at a staggering figure of $130 billion in increased repair costs. 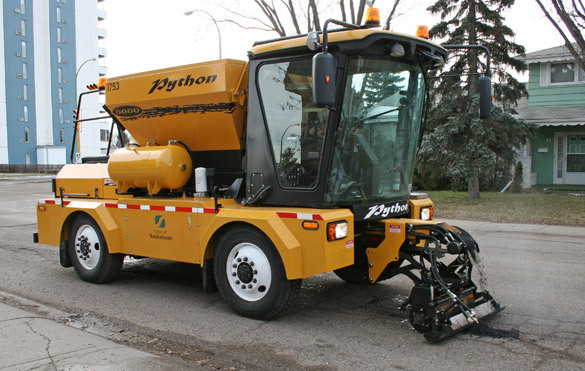 No matter how you calculate it, a town or city can see substantial savings – in saved lives, reduced resurfacing costs and reduced cost of vehicle repairs for its citizens – by simply investing in a Python 5000 pothole patcher.